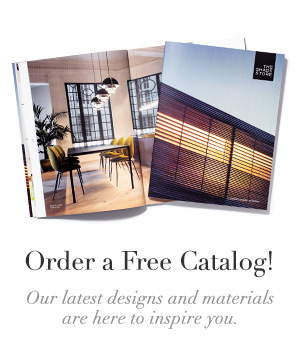 We can’t wait until the 2016 Architectural Digest Design Show! This year, we partnered with two designers who have reimagined the two “living room” walls in our booth: Tilton Fenwick and Villalobos Desio. Last week we introduced you to Tilton Fenwick. Now, we’d love to tell you more about Mercedes Desio and Alberto Villalobos and their international design firm, Villalobos Desio. What was your inspiration behind your window design for The Shade Store’s AD Design Show booth? Our window design was inspired by our interpretation of a private library, a solemn space for escaping with one’s thoughts. Why did you choose that specific color palette? Have you used these color combinations before? This is our favorite color palette, we wanted to include it here as grays and blues are our favorite colors. What type of house/lifestyle do you see this combination of window treatments living in? Do you always layer your window treatments? What does layering window treatments bring to a space? Yes, we always do. Layering window treatments brings depth and texture to any space. It also allows you to control the amount of natural light filtering through, creating different levels of privacy, and playing with shadows. What type of patterns do you typically like to work with as a designer? 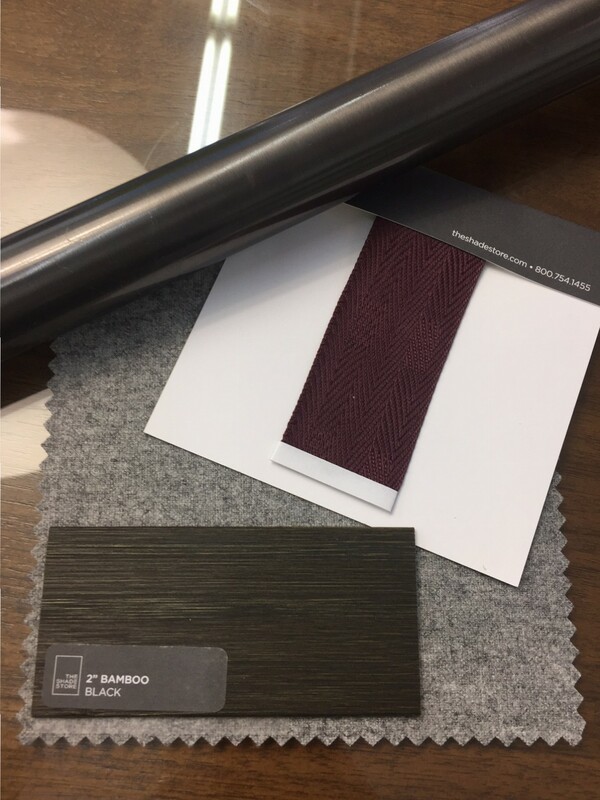 We prefer to work with herringbones, stripes, or tone-on-tone damasks. How was your experience selecting treatments from The Shade Store? Our experience was great, as always. First off, there is a great selection, and most importantly the people working there can provide great guidance and give great advice when needed. What was your favorite part about this design process? Because this was a conceptual project, we were able to have fun with it by choosing different textures. Why did you choose this specific paint or wallpaper? We feel that the wallpaper complemented the texture of the fabrics/materials chosen, due to its moodiness and pattern. What window treatment advice to you most often give to your clients when decorating a space? To always layer window treatments. It is important to create different moods in a space. Do you have a favorite material in window treatments? No, because every project is different, it is difficult to narrow it down. What tips can you share about choosing the right pattern/material for a window treatment? The pattern/material for a window treatment depends on the scale of the space as well as on the level of light that comes through. Where and when does pattern work best? Pattern can work anywhere, it depends on the overall concept of the project. 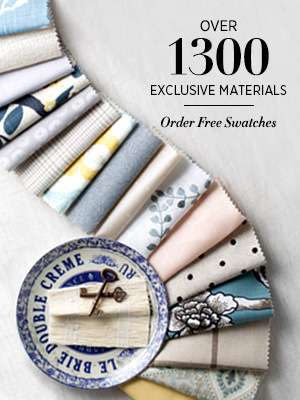 Pattern could be created by mixing materials, or just by using a border with a plain fabric. Or even using beautiful wood blinds. How/when do you start thinking about window treatments in the design process? We think of window treatments as soon as we begin the projects to complement the design. 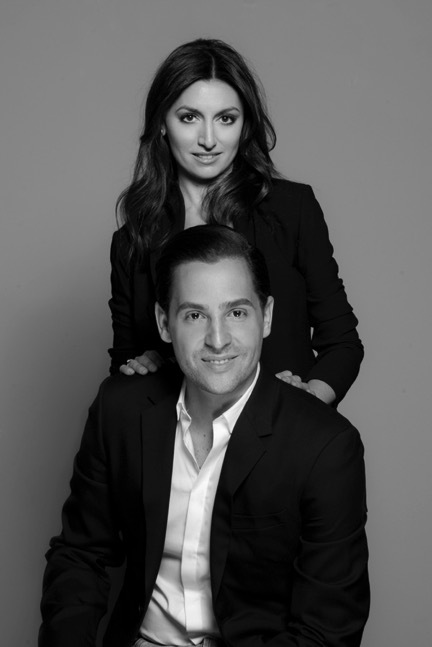 Mercedes Desio and Alberto Villalobos are international interior designers and tastemakers based in New York City. The pair studied at the New York School of Interior Design where, after obtaining their degrees, they decided to open their design firm Villalobos Desio as well as their antiques boutique ETOS in New York City. Alberto, whose nationality is Colombian, and Mercedes who is Italian, wanted to combine the eclectic and international senses of aesthetic acquired from their diverse cultural backgrounds, travels and education. Their successful partnership was driven by the fact that they seamlessly integrate their uniquely different viewpoints thereby maximizing their creativity. The result was the creation of Villalobos Desio, an emerging firm that has been commissioned to design homes in the U.S. and Europe for a discerning group of international clientele. 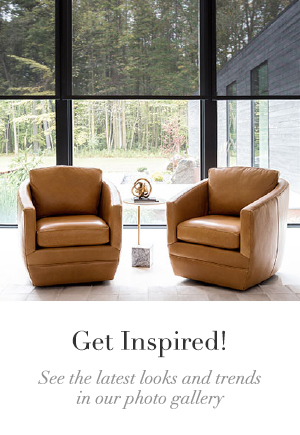 Villalobos Desio are known for successfully mixing new pieces, antiques, and contemporary art; their aesthetic is inspired by a wide range of cultural influences from French, African, and Pre-Columbian, to Asian and American. In creating an environment, they tell a story that complements the backgrounds of their clients. See their living room window design at Booth #807, to the right of the main entrance. You can also meet both our design partners during our cocktail party on Thursday, March 17 from 5:00 – 7:00 p.m.